Frequently repetitive and surprisingly boring, Mr Nice fails to really get to grips with its subject and is ultimately something of a disappointment, despite a superb central performance from Rhys Ifans. 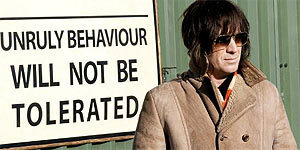 Directed by Bernard Rose, Mr Nice is based on the memoir of notorious drug smuggler, pot-head and Welshman, Howard Marks, who was once described by the Daily Mirror as “the most sophisticated drug baron of all time.” Beginning, briefly, with his teenage years the film follows Marks (Rhys Ifans) from his early days in a rugby obsessed Welsh mining town to a stint at Oxford, where Marks falls in with the ‘60s druggy crowd and starts dealing marijuana. After being asked to rescue a dealer friend's consignment, Marks sets out on his own, importing hash with the help of an Indian businessman (Omid Djalili) and eventually falling in with hot-headed IRA boss Jim McCann (David Thewlis), whose weapons smuggling routes come in very handy. Despite various arrests, setbacks and attempts to go straight, Marks continually returns to smuggling, despite the protestations of his wife (Chloe Sevigny) and family; he also eventually attracts the attention of both MI6 (who attempt to recruit him) and a tenacious American DEA agent (Luis Tosar). Rhys Ifans was obviously born to play Howard Marks and his superb performance is the best thing in the film, perfectly capturing Marks' laid back likeability. However, the supporting cast is less successful – Sevigny's dodgy English accent is a constant distraction and Thewlis rather overdoes it as McCann, his performance eventually bordering on over familiar caricature rather than convincing as a real person. The film's biggest problem is that it's frequently repetitive and never really comes to life, largely because it fails to get to grips with its subject matter. For instance, the script never attempts to explore the idea that Marks' likeable bloke-down-the-pub stoner routine doesn't quite fit with someone who was also prepared to go into business with terrorists. The film is also let down by some inconsistencies in tone – for example, the conceit of having Ifans play Marks as a teenager (complete with ill-fitting school uniform) hints at an inventive wit that is ultimately lacking from the rest of the film. Despite a superb central performance from Rhys Ifans, Mr Nice is ultimately something of a disappointment, thanks to a repetitive, frequently dull script that fails to get under the skin(s) of its subject.